Apple has finally revealed its hotly anticipated Apple Watch Series 4 wearable; showing off a new, larger form factor, upgraded hardware and more new features than you can shake a stick at. Despite all rumors, Apple watch doesn’t have a circular screen; the new model comes in rounded squared shape once again. Instead of redesigning watch’s size, Apple has made some subtle but the important tweaks to refine the design. The new Apple Watch 4 is available in 40mm & 44mm sizes. This makes the watch much wider than the previous generation Apple watches, which came in 38mm or 42mm options. According to COO Jeff Williams, the works means the 40mm version’s screen is 35% larger and the 44mm’s display is 32% bigger. Apple’s added a new Watch Face to help take advantage of the wider screens. It features eight new “complications”. Time regions you need to keep track of, or usually used apps and services. New Speaker that Apple claims are 50% louder than the Apple Watch 3’s. The mic has also been placed to the opposite side of the watch to the speaker to reduce noise. It is like a boon to all those Apple Watch users who take calls on the watch or regularly use Siri. As an additional benefit for the users eyeing up the LTE version, Apple has also reworked the Watch 4’s rear. The bottom surface of the Apple watch is made of black ceramic & sapphire crystal. This is so radio waves can pass through the front & black for the better cellular reception. Under the umbrella, Apple has made a few more significant changes. For new users, it uses a new S4 dual-core 64-bit CPU that the company states is twice as fast as its predecessor. 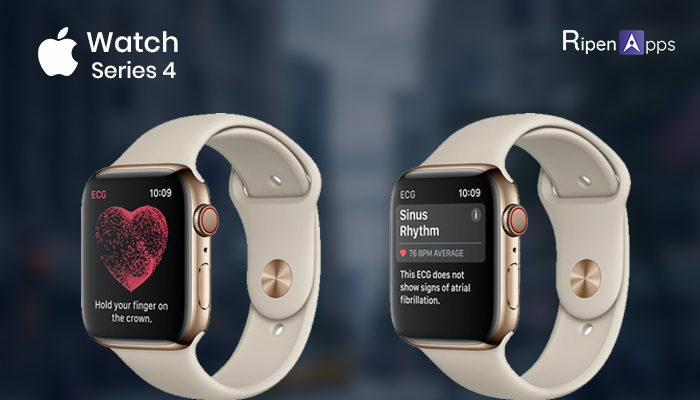 Apple’s added an ECG sensor to the watch. This, according to Apple is a world first for users. The new ECG sensor sits on the back and lets you take an electrocardiogram utilizing the digital crown. After 30 seconds, the ECG reading is made obtainable complete with a rhythm classification. As per Apple, the ECG will be able to warn of Atrial Fibrillation, which is a heart condition that could lead to major health complications. The standard heart rate monitor can now alert you if your heart rate is too low and your health is in danger. For regular joggers, Apple has also enhanced the accelerometer and gyroscope. The sensors now have twice the dynamic range and can detect and read motion data eight times faster. Resulted, the Watch can detect when you fall over. If no motion is detected after 60 seconds, the Watch can call emergency services automatically, as well as sending a message and location to emergency contacts. Pricing for the non-LTE Apple Watch 4 starts at $399. The most basic LTE Apple Watch 4 will retail for $499. We’ll bring you UK pricing once it’s available. You can preorder the Apple Watch 4 from Friday, September 14 and it will go on sale Friday, September 21.